Star Automation (SA) is an ISO 9001:2008 certified organization. We are one of the Global service providers in the field of Industrial, Medical, Military and Communication Equipments. We are the authorized Service provider for many brands. We are specialized in providing service and maintenance for Servo Motors , Servo Drives, PLC, VFDs with an experience of 15 years. We have automatic computerized In-circuit tester to test the circuit boards. SA is one of the leading Suppliers in India and abroad. We are the authorized solution provider and supplier for Yaskawa, Panasonic, Fuji, Delta make Servo, VFDs, PLCs, Sensors, speed reducers & Motion Controllers. We are expert Servo Error Codes Repair in India. We are having servo drive Error code repair facility for many servo drive brands. We have servo drive error code technicians, Error code finder & Error code solutions provider. We offer the fastest turnaround times available for servo drive error code Repair. We have expertise to repair all types and makes of servo drives and also including AC servo motors & DC servo motor, spindle and stepper motors. We are specialized in providing technical solutions and consultancy for these products. We are offering Panasonic, Yaskawa, Fuji, Mitsubishi new servo drive. We service, repair, replace, built, rebuild, regrind, recondition, refurbish, re-manufacture, retrofit and overhaul all servo drives. We are Providing repair and maintenance service for siemens Industrial Automation products ,rail systems and locomotives control systems. We are also offering VFD, AC drives, PCB Board, control modules, traction converter, microprocessor based control systems, 25 kva inverter, service. We are having well trained and skilled engineer. Packaging Details: 1) Worth Cotton Packing. 2) Based On Customer satisfaction. 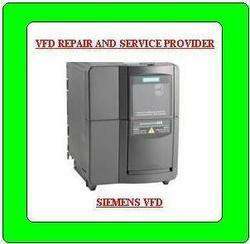 Looking for Siemens VFD Sale & Service ?